The transmission repair work described on repair order (your repair order number goes here) and not including any of the other components or parts of the (your vehicle's year make and modle goes here) with VIN (your vehicle's VIN goes here) and having an odometer reading of (your vehicle's current odometer reading goes here) at time of the repair on (the date the repair was made goes here) is warranted to (your name goes here) against failure caused by defects in workmanship and materials for the period of (the agreed warranty time and mileage goes here, standard warranty is 18 months or 18,000 miles but additional warranty time and mileage may be purchased) miles, whichever comes first; if later repair on parts and labor purchased is necessary within the time and mileage specified in the terms of this warranty, then it will be provided without charge to (your name goes here) within the limits of this warranty at COASTAL TRANSMISSION SERVICE. as named on the original repair order, number (the repair order number goes here). This warranty DOES NOT COVER CONSEQUENTIAL OR INCIDENTAL DAMAGES relating to property damage or pecuniary loss of any kind, including but not limited to lost earnings, property damages, inconvenience, towing or rental car charges, loss of vehicle use, commercial loss, damage to part covered by this warranty by a non-covered part or damage to a non-covered part by a covered part. COASTAL TRANSMISSION SERVICE’s obligation under this warranty is limited to replacing or repairing defective parts and correcting defectively furnished labor. · The work performed can many times fail due to no fault of COASTAL TRANSMISSION SERVICE. 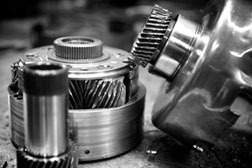 Parts related to, but not a part of the transmission, can go bad after the transmission job is completed, and adversely affect the transmission, converter or seals. Under these circumstances, your warranty is not valid. In no way can COASTAL TRANSMISSION SERVICE predict these events, and therefore is not responsible for them. A partial list of related parts is set forth in the next paragraph. · COASTAL TRANSMISSION SERVICE is responsible only for the parts and labor purchased by (your name goes here) on invoice (the invoice number goes here), that prompted the issuance of this warranty, and not for subsequent failures of, or damage resulting from, related parts or units as shown in the following: these items consisting of, but not being limited to: a. levers; b. controls; c. linkage; d. radiator; e. coolers; f. rubber mounts; g. external oil lines; h. electrical accessories. The foregoing and other parts are not normally included in or with a transmission repair job. · This warranty will not be valid if the (your vehicle's make and model goes here) has been used for towing purposes unless a proper transmission cooler has been installed on the (your vehile's make and model goes here); nor will it be valid if the transmission assembly has been tampered with outside a qualified repair shop; or if it has been improperly installed by other than an approved shop of COASTAL TRANSMISSION SERVICE; or if factory approved fluid has not been used in the assembly; or if it has been abused or damaged in an accident; or if it has been used for purposes other than typical city and highway driving; or for purposes outside of those for which the (your vehicle make and model goes here) was designed. · COASTAL TRANSMISSION SERVICE RESERVES THE RIGHT TO REFUND FULL PURCHASE PRICE IN LIEU OF ALL CLAIMS OTHERWISE DUE (your name goes here) UNDER THE TERMS OF THIS WARRANTY. IN SUCH CASE, THE REFUND OF THE FULL PURCHASE PRICE SHALL BE (your name goes here)’s EXCLUSIVE REMEDY. · Always take the (your vehicle's make and model goes here) back to COASTAL TRANSMISSION SERVICE. This must be done at your own expense; COASTAL TRANSMISSION SERVICE is not responsible for towing, shipping, or any other expense that might be incurred in transporting the (your vehicle's make and model goes here) to COASTAL TRANSMISSION SERVICE or any authorized shop. · Any and all implied warranties provided by Georgia law or otherwise, including any IMPLIED WARRANTIES OF MERCHANTIBILITY OR FITNESS FOR A PARTICULAR PURPOSE, are hereby limited to the terms and duration of this warranty. IT IS NECESSARY THAT (your name goes here) HAVE THE OPERATION OF THE TRANSMISSION CHECKED BY COASTAL TRANSMISSION SERVICE WITHIN FIFTEEN (15) DAYS FROM (the date of the repair goes here), THE DATE OF INSTALLATION. THIS INSPECTION WILL BE PROVIDED BY COASTAL TRANSMISSION SERVICE FREE OF CHARGE. IT IS (your name goes here)’S RESPONSIBILITY TO MAKE ARRANGEMENTS FOR THIS INSPECTION.